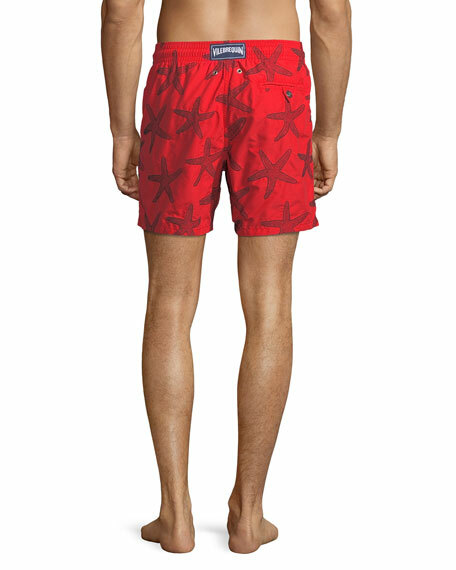 Vilebrequin "Mistral" swim trunks in allover starlettes embroidery. Moncler swim trunks in tricolor floral print. Drawstring front with elastic waistband. Side slip pockets; back button-down flap pocket. Hem ends above knees. Nylon; polyester lining. Made in Bulgaria. Moncler microfiber swim trunks with signature tricolor taping down sides. Back flap pocket. Elastic waistband. Straight-leg fit. Nylon. Made in Bulgaria. Model's measurements: Height 6'1"/185cm, waist 32"/81cm, typically wears size M. Please note: Moncler runs small. We suggest that you order a size larger than you typically wear. Peter Millar good fortune swim short. Snap-button front; elastic waistband. Side slip pockets; back snap-button flap pocket. Pull-on style. Polyester. Peter Millar good fortune swim short. Snap-button front; elastic waistband. Side slip pockets; back snap-button flap pocket. Pull-on style. Polyester. Imported. 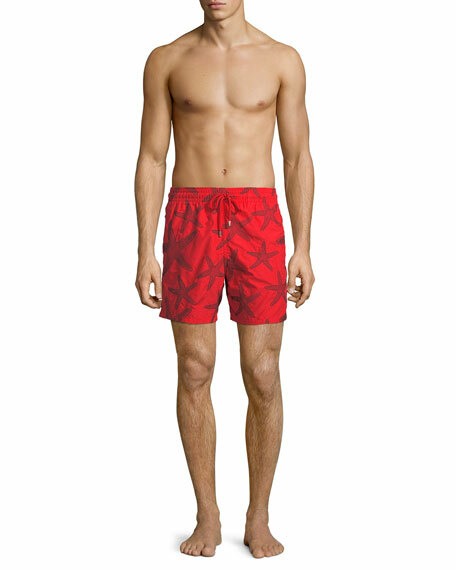 Peter Millar swim trunks with triple scoop print detail. Button front with elastic waistband. Side slip pockets; back flap pocket. 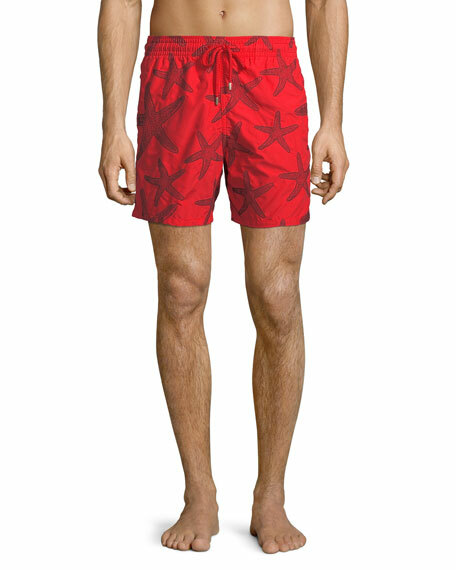 Peter Millar swim trunks with triple scoop print detail. Button front with elastic waistband. Side slip pockets; back flap pocket. Pull-on style. Polyester. Imported.